I’ve just about finished the second week of my month-long practicum at Burke and I feel like time is flying! I can’t believe I’m nearly halfway done with my internship. Even though it’s summer and we are between semesters, Burke is as busy as ever; the whole staff is buzzing around with new and existing projects, visits from students and researchers, and making sure the library facilities are up to snuff for the upcoming semesters. I’ve been really excited to be here at Burke—I’m home in New York for the summer from the University of Illinois, where I study library science. So far, it’s been most interesting to see the theories and methods I’ve learned about in my library classes put into practice; it’s very different learning about library administration or how to develop library projects and actually doing these things. In my practicum, I’m working on a few main projects. For the first, I’m working on microform weeding. Burke has a storage room filled with cases of microfilm and microfiche and it makes sense to move some of them to other libraries or storage locations on campus so they can be used more widely and the space can be used for other purposes. I’m working on assessing which microfilms are unique to Burke Library and which are duplicated in other Columbia collections. I’ve also been working on creating a new online form for patron reference interactions; some day soon, you’ll (hopefully) be able to submit your reference questions and research topics via the Burke website and then receive an email answer from a librarian. One of the best parts of my practicum is getting to meet with all of the members of the permanent staff here. They’ve been explaining to me what they do and are letting me see them in action. It’s been great sitting in at the various departments and getting to see how the staff works individually and as part of a larger team. I’ve also been able to try my hand at the circulation desk, which is something, surprisingly, I’ve never gotten to at a library! What’s becoming very evident to me in my time at Burke is the library’s emphasis on reaching patrons where they are. 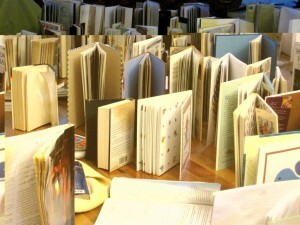 The book stacks, for instance, have been opened up in the past year or so to let researchers and students explore the resources available to them. The librarians are rearranging and reorganizing the space to meet the needs of its visitors, and, as I know from my projects, the library is making it simpler to submit any reference questions patrons may have. I’m looking forward to my final half of my internship and to the new projects that will come with them! This entry was posted in Student Entry on July 21, 2014 by Caitlin Stamm. My First Day as an Intern: So Much to Learn! Today is my first day as an intern at the Burke Library, working with Brigette on the UTS archives. One of the tasks of getting started is to write a blog post about what I hope the internship will teach me. You can see some entries from my predecessors and fellow interns here, here and here. I come to this internship having completed most of the requisite number of credits for my Masters in Library Science at Pratt. I’ve studied all kinds of things related to digital libraries and libraries’ use of social media in outreach and research. I’ve learned the basics of metadata and collection development. However, none of my coursework so far has incorporated more than a cursory study of archives. And I’ve been kicking myself about that since I started talking to Brigette. 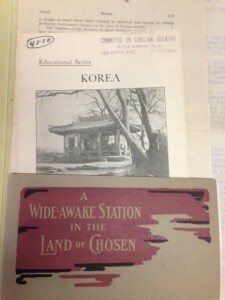 I had clues that I might be interested in archives: I tend to pore over antique cookbooks and recipe collections, and rummage through bins of vintage photographs at yard sales; and I got positively starry-eyed over maps George Washington had drawn, when I saw them on a school trip to the Library of Congress. And yet, I haven’t taken so much as an introductory archives class. What have I been thinking? The learning curve of getting started at Burke will include more than just the usual directional and procedure orientation to how things work here. I know I need to develop my understanding of archival theory and procedures from the ground up. I come to this internship with a rudimentary knowledge of how to work with archives: wear gloves for photographs, use pencil to take notes. I’m sitting at a desk surrounded by shelves of tantalizing gray boxes. As this internship progresses, I look forward to learning my way around the care and documentation of the knowledge contained in these boxes and the rest of the collection, piece by piece. I’ve started reading about archives, so I can begin to fit these mysterious boxes into a larger context of what archiving means. I’m also looking forward to working on developing ideas and content for the social media at Burke. I’m looking forward to learning more about what works best for archives and libraries on social media and using different platforms to showcase the great resources in the collections here. What are some of the discoveries you’ve made in the collections here? Tell me about your favorites in the comments! 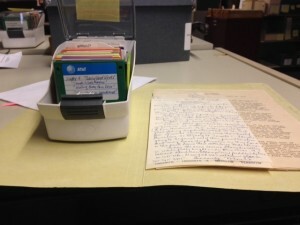 This entry was posted in Student Entry and tagged Burke Archives, Burke Library, interns on July 16, 2014 by Elizabeth Willse. When I arrived the morning of May 20th, I was met with a flurry of activity. Over the previous weekend, a small drip had made a big mess in the reference section of the reading room. Since it was so small and over the weekend, we didn’t notice it until it had reached several books. I immediately headed to the conference room to do damage control. Good news first: only a few books were beyond saving. The water in its slow creep hadn’t had time to do much damage. Plus most of the books were large, heavy reference books, with hardcovers that actually kept the pages more or less above the flood. Those that had been hit were also easy-to-replace, and the books with wet covers could be rebound. All in all, not a worst-case scenario. However, there was some work to do. In order to keep the moisture from seeping and staying in the books, thus creating a mold problem and disfiguring the books, we had to dry them out. 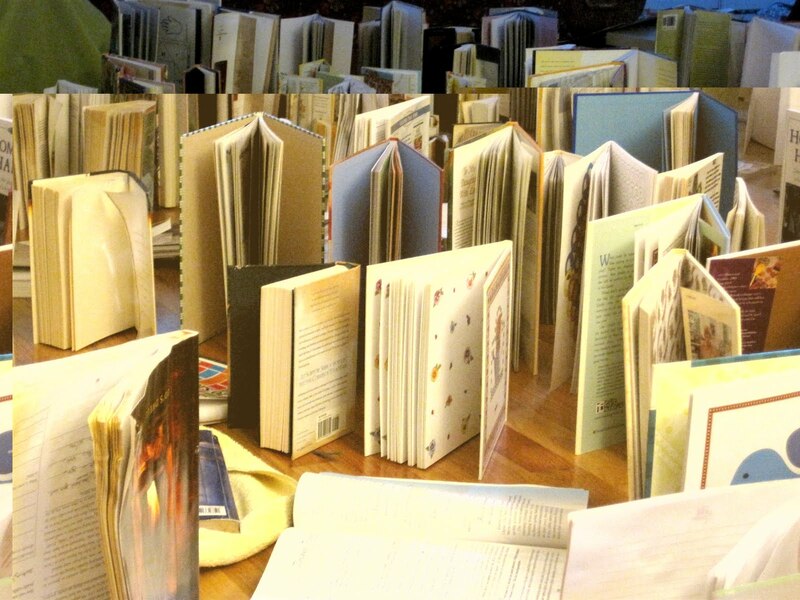 To do this, we placed paper towels in between the pages that were damper than others, and set every book standing up facing a fan to dry out the book right down to its spine. It took 4 of us about 4 hours to collect the books, carefully inspect them, decide which ones needed additional help, set them up, and monitor their improvement. In both my internship and classes we spend a lot of time discussing preservation and techniques used when working to quickly salvage a damaged collection, but it was the first time I had ever put these teachings to practice. I can’t say I enjoyed it – after all these were books on the line, and I would never ever wish them harm – but it was a learning experience. The quick thinking of the Burke library staff, their calm demeanor, and instant evaluation of the situation allowed a lot of books to be saved. We are currently double-checking the shelves to make sure the leak has been thoroughly sealed and won’t damage any more books. If you see a library staff member, thank them for the work they did to save the reference books you need! This entry was posted in Collections, Student Entry and tagged Burke Library, interns, Water Disaster on July 8, 2014 by Sarah Davis.